The Treeing Tennessee Brindle should be evaluated as a working dog, and exaggerations or faults should be penalized in proportion to how much they interfere with the dogs ability to work. Honorable scars resulting from field work are not to be penalized. The origin of the Treeing Tennessee Brindle will probably always be a mystery. It is known, however, that there were very many old-time dogs that came from select, little pockets from all over the country. These dogs were open trailers with good scenting power; were very intelligent and courageous, and companionable with both men and dogs. The originators of the breed searched to find and promote that type of dog. There were many Cur-type hunting dogs at that time, but they concentrated on the type of dog that had the uncanny ability to locate and tree any game. 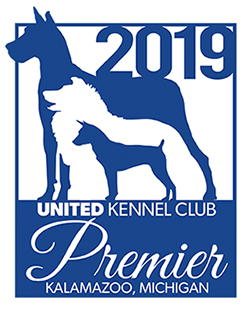 The Treeing Tennessee Brindle was recognized by the United Kennel Club on July 1, 2017. The Treeing Tennessee Brindle is a powerful, agile tree dog of medium size. Its appearance suggests the capacity for speed stamina and endurance. The Treeing Tennessee Brindle has a strong treeing instinct, desire to hunt, and good scenting power. This breed is a fast hunter, intelligent, alert, and companionable with men and dogs. The topskull is flat. There is width between the eyes. The muzzle is heavy. The dark, expressive eyes are prominent. The short or medium ears are set high. The straight, muscular legs are well set for speed. Dewclaws are permitted. The back is straight and strong. The chest is broad and deep. HIND LEGS The straight, muscular legs are well set for speed. Dewclaws are permitted. The round, compact feet are strong, and have well-arched toes (cat feet). The tail is medium length. The coat is short, dense and smooth. Acceptable colors include: brindle or black with brindle trim. A small amount of white on the breast or feet is acceptable. Serious Faults: Colors other than brindle, or black with brindle trim. Height is measured at the withers. The height range for males is from 18 to 24 inches. The height range for females is from 16 to 22 inches. Weight is in proportion to height. Gait is smooth and effortless, with good reach of forequarters. Rear quarters have strong driving power, with hocks fully extending. Viewed from front and rear, legs turn neither in nor out; nor do the feet interfere with each other. As speed increased, feet tend to converge toward the center line of balance. They are open trailers, with changeover at the tree. A coarse chop is preferred.